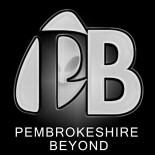 Who or What has been captured in Pembroke Photo? Who or what is the Strange Figure captured in this photograph? It was while enjoying a lunch to discuss an investigation that Pembrokeshire Beyond members G L Davies and Keryn Williams noticed something very odd on the wall of the Food at Williams restaurant on the main street in Pembroke. The walls adorned with pictures of Pembroke through out the ages had one peculiar image. The photograph appears to have the shadowy figure barely visible on the left hand side. Used with permission from Food at Williams in main street, Pembroke. But who or what is the behind the transparent and mysterious figure? A copy was taken and presented to a local photography expert. He was most intrigued. As a local business man he asked for his identity to be kept private but did have these words for us. What do you see? Keep reading for the close up. Who or what is behind the Pembroke main street figure? You can look at the picture for yourself by visiting Food at Williams in Pembroke on the main street. Enjoy a tasty lunch while pondering the origin of the shadowy figure. Who or what was behind it? If anyone has any information regarding this picture then please contact paranormalchronicles@aol.com and if you have any views, theories or opinions then please get in touch. Keep safe and sleep well. Is this the most haunted house in Pembrokeshire? If you enjoy accounts of the Paranormal then why not read the #1 Bestselling novel and audio book A most haunted house by G. L Davies . A most haunted House is based on a true and terrifying account of a prolific and aggressive haunting in the small Welsh Town of Haverfordwest in West Wales. Seen as controversial and sparking debate between skeptics and believers alike due to the ferocity and intensity of the haunting, A Most Haunted House is the eye witness account of a young couple fighting to keep their new home and each other as an entity tears their world apart. It’s free to Borrow through Amazon Prime and is also available in paperback and Kindle or listen to on AUDIBLE. With over 25,000 copies read will you join the investigation? Dare you read? Dare you click on the book cover below? This entry was posted on April 12, 2015 by The Paranormal chronicles in Ghosts and Hauntings and tagged Food at williams, Ghosts, mains street figure, Pembrokeshire, Photography.